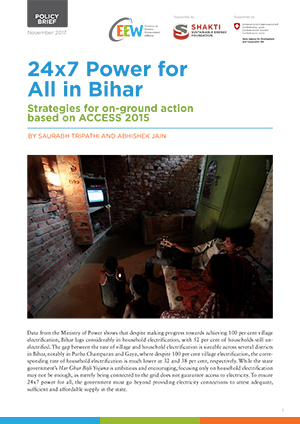 Over 800 million Indians use traditional biomass cookstoves for their cooking needs. This widespread use of traditional cookstoves poses serious risks to health and women’s empowerment. It also is a global warming threat, as they emit black carbon, a highly potent short-lived climate pollutant. 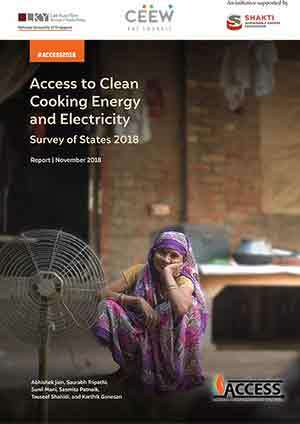 Access to clean cooking energy has the transformative potential to curb the health risks posed by traditional cookstoves while also reducing the time spent by women on unpaid domestic work. 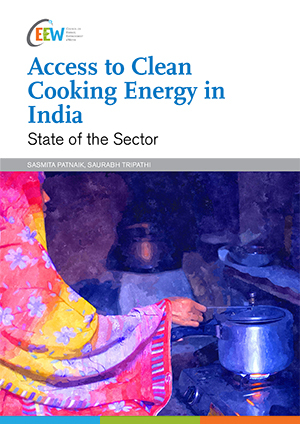 This report provides an overview of the clean cooking energy sector in India, including policy and market developments over the last few years. It outlines the key ecosystem-level challenges in creating sustained demand for clean cooking energy products and in building capacity for manufacturers and suppliers of such solutions. It also details critical avenues for intervention in policy and through investments to eliminate the inefficient use of traditional biomass by households in India. Less than one per cent of households in India use biogas for cooking. Eighty-eight per cent of households not using LPG report high recurring costs as one of the bottlenecks to adoption of LPG. More than 70 percent of rural households in the lowest seven percentile classes use firewood and chips for cooking, indicating a higher use of traditional biomass among low-income households. Access to reliable electricity supply in rural areas remains a major barrier to the penetration of electricity-based cooking. Just over one per cent of rural households used an electric or induction stove in 2015, with only 0.01 per cent of households using it as primary cooking energy. As of 2013, only three per cent of urban households in India had PNG connections. 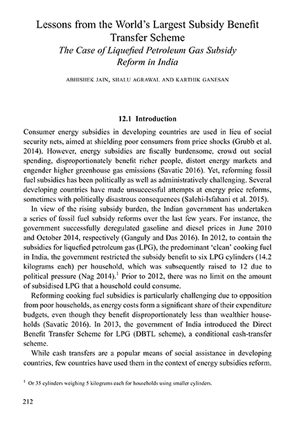 Almost half of the households in India having LPG were not using it as their primary cooking fuel, indicating that affordability concerns lead to stacking of cooking fuels. 29 per cent of the rural households and 34 per cent of the urban households in India were stacking traditional fuels with LPG. Building awareness and addressing affordability concerns for improved biomass cookstoves (ICS) and biogas will be necessary to increase adoption. 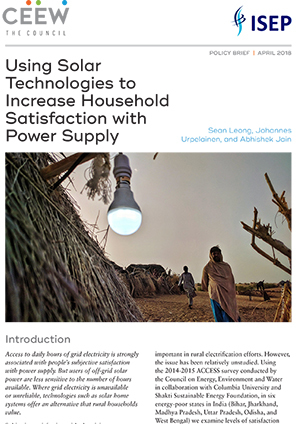 Feasible business models to enable availability are critical for better access to clean cooking energy solutions. The existing infrastructure struggles to provide last mile connectivity at affordable prices. Operations and maintenance (O&M) of systems in rural areas is a strong determinant of the sustainability of a fuel or technology. Significant investments are required in R&D to improve efficiency of both ICS and induction cookstoves. Many challenges remain in the implementation of standards and testing for ICS. Lack of market intelligence, strong data management systems, and limited ability to evaluate the impact of their products are leading challenges for enterprises operating in rural areas. Access to commercial finance is limited for last mile energy enterprises. Build awareness through communication and behaviour change campaigns to influence adoption of clean cooking energy solutions, and include ministries responsible for health, rural development, environment and women and child development. Enhance affordability of solutions by reducing the cost of the fuel and cooking devices, providing consumer finance, and through interventions that strengthen livelihoods. Reduce the upfront cost for households through innovative payment mechanisms such as pay-as-you-go and rental models. Leverage local institutions and groups for efficient and faster delivery mechanisms. Set-up local manufacturing and servicing facilities to sustain prolonged use of clean cooking energy solutions, through improved accessibility and affordability. Evaluate adoption and use of clean fuels and technologies to provide the much-needed evidence to inform future interventions. 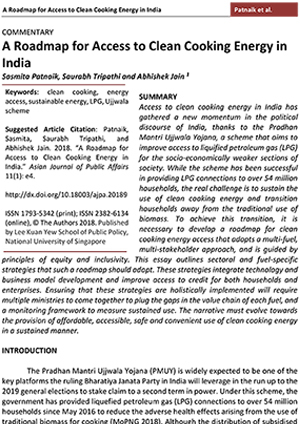 Including access to clean cooking energy for all in the broader development narrative can deliver 10 of the SDGs and bring about a paradigm shift in the cooking energy space. Encourage field-based tests to demonstrate performance of ICS with local cooks, foods, practices, and fuels. Modify norms for rural LPG distributorships to accommodate the higher transaction cost of operating in rural areas will be crucial to improving availability of LPG. Encourage new business models for biogas operated by entrepreneurs at local and regional levels tol enable greater adoption of the fuel. Encourage local manufacturing of ICS fuels – pellets and briquettes, for economic viability and local availability. Raise patient capital support for early stage clean cooking energy enterprises for R&D and large-scale pilots.